There is a certain sense of satisfaction that comes from overtaking a motorized vehicle. On a dusty road in central Cambodia, the game of catch-up continues down an expansive stretch. Ourselves on bicycle and our challenger being a heavily laden motor-cart, we smile and wave each kilometer or so as the vehicle creeps slowly along, boasting a variety of fine ceramic goods. Amongst the rust-colored selection, the glint of sun on metal highlights one particular product for sale: the New-Laos Stove. 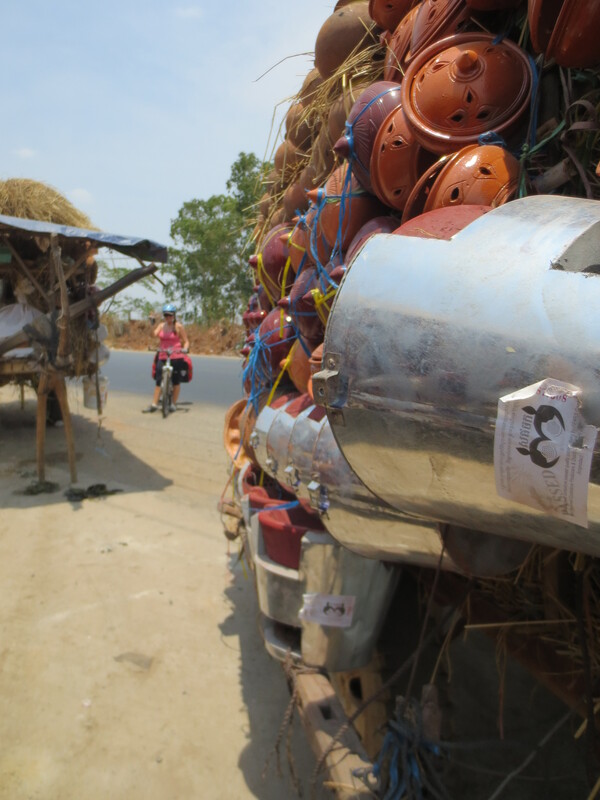 Across Cambodia, carts such as these make their way through communities – stopping and starting down the highway to make sales to local consumers. 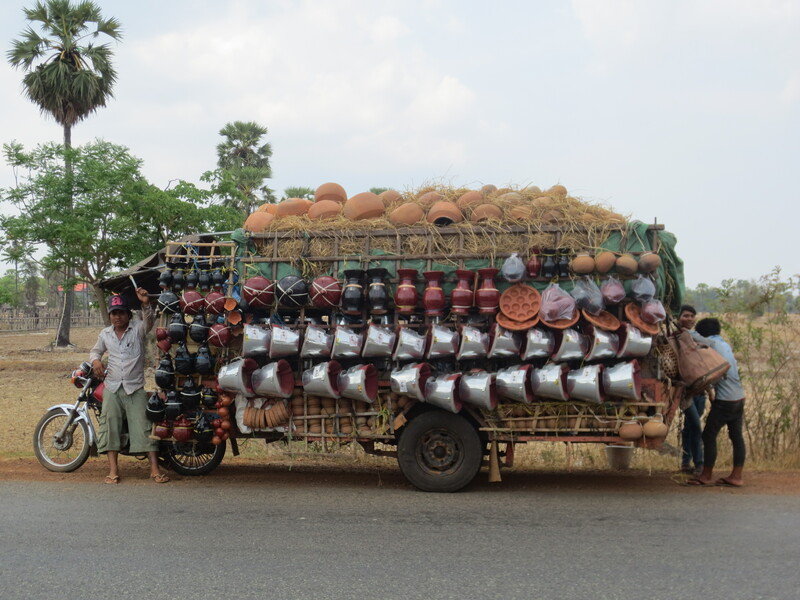 Operated by distributors of ceramics from the Kampong Chhnang region, they sell their wares off one-by-one and then return home to reload and set off once again. Seemingly straight-forward, it is the cooperation with stove producers and distributors such as these that has led to the success of GERES’ Improved Cook Stove initiative with over 2 million stoves sold to date. 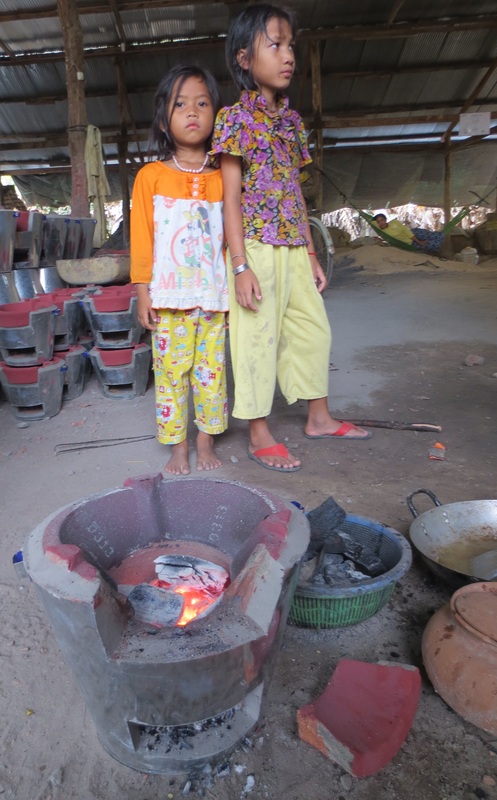 Begun in 1994, the Improved Cook Stove initiative was a response to the stress being placed on Cambodia’s precious natural resources. The program brings change home, quite literally, with the introduction of new technologies to the long-standing stove design. Traditionally a self-contained device allowing for fire or charcoal to apply direct heat to a pan nestled on top, GERES partnered with the producers of the region to implement slight design modifications for greater efficiency. Research dictated that by increasing the number of holes in an internal grate allowing for oxygen flow and by controlling the amount of heat loss with insulation and the narrowing of gaps, it was possible to increase the stove’s efficiency by 22%. Producers embraced the new design seeing a promise for greater sales and the stoves hit the market. Intrigued by the success of this program, my riding partner and I decided to stop and see the results in action, hoping to learn a thing or two about Khmer (Cambodian) cuisine in the process. We made our way to the project center, Kampong Chhnang, about 80 km northwest of Phnom Penh. There, we were met by Mr. Makara Srey, one of GERES’ 80 employees working in the region. First, our new friend escorted us to see the production. We arrived at what seemed to be a typical cluster of houses lifted up from the earth on stilts. Makara explained that the lofted home design allows for the families to do their living up above, while also having a sheltered space underneath from which to run their business. In the community where we arrived, the trade of choice was stoves. We were introduced to Ms. Sakun Tes and her family. 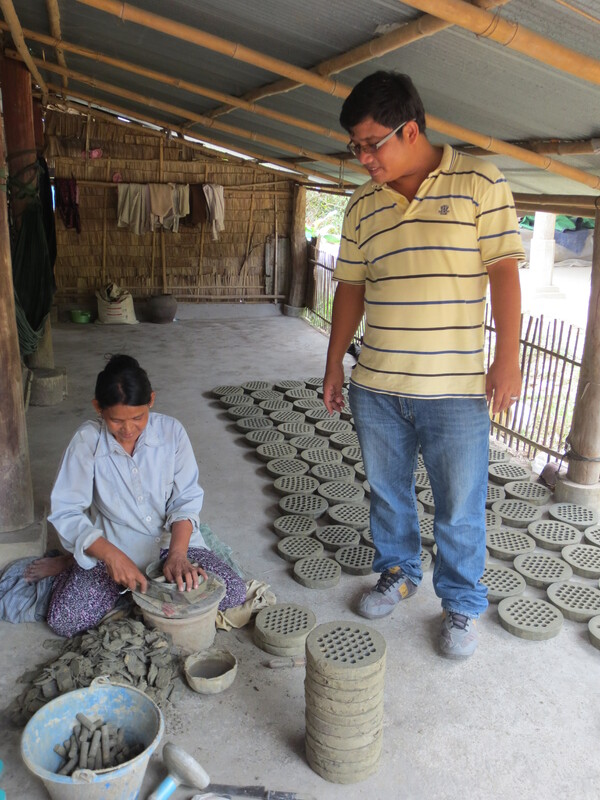 Ms. Tes is the matron behind a production facility of New Laos Stoves. Working independently from GERES, this facility is part of a nationwide cooperative of stove producers that is reaping the benefits of the demand for modified stoves. Made with materials such as locally sourced clay and rye ash as insulation, each stove takes about 7 people and 14 days to complete – depending upon the season. 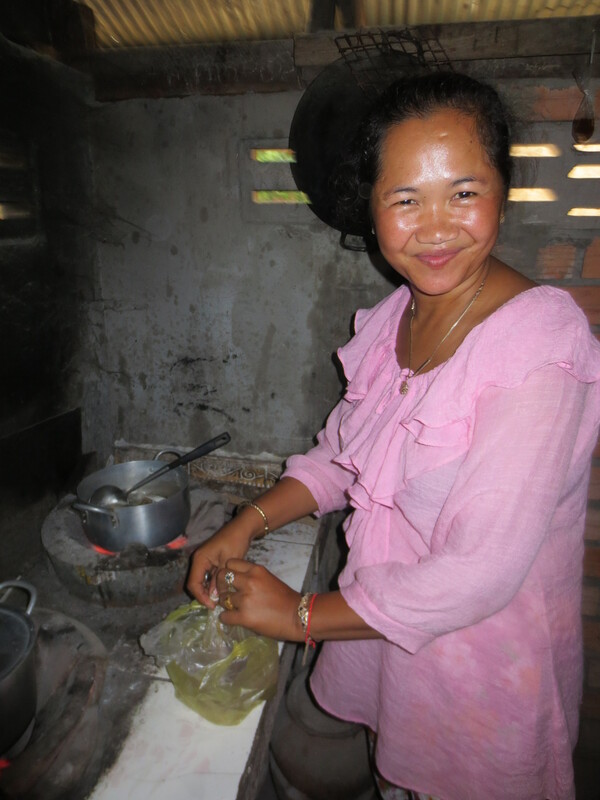 After a tour of the assembly, we settled in to observe Ms. Tes’s daughter, Soy Savy, as she prepared the family’s meal on a tandem of New Laos Stoves. Working in the corner of a cinder-block structure, Savy lit the charcoal in one of her stoves. Able to be used interchangeably with charcoal or wood, Savy rationalized her preference for charcoal in that it left her cooking pans clean while wood tends to blacken the surface. While she waited for the briquettes to burn down in order to cook, she began her preparations on the menu of the day: fish head soup. Savy chopped and pounded away with little Sovanphanha tugging at her pants, scurrying in and out to make sure her father didn’t need anything and her baby was still sleeping soundly in the hammock. When the briquettes were glowing at temperature, she set a pan with rice on the stove to simmer away. Once confirmed as done, she removed the pan, shuffled a few of the warm briquettes over to her second stove to warm the rice, and set to work on the soup. 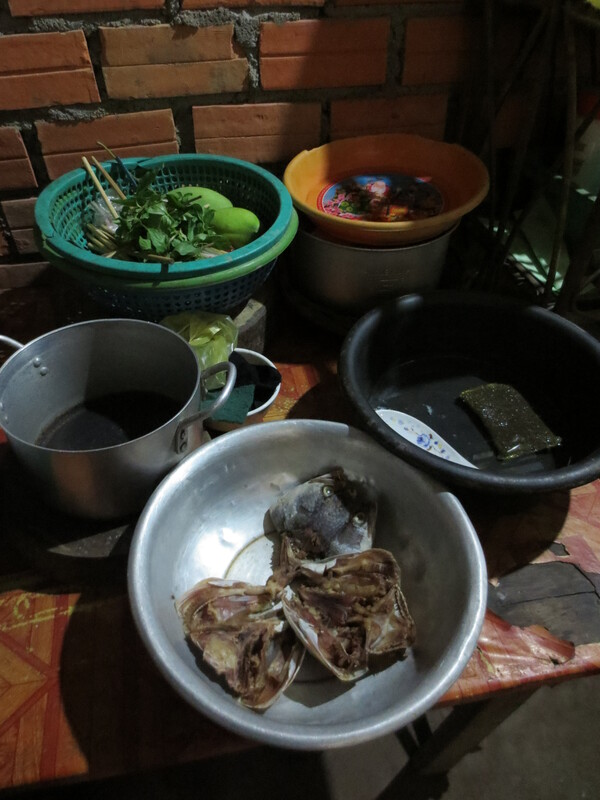 Savy relied on a common selection of Khmer ingredients to develop her flavors. 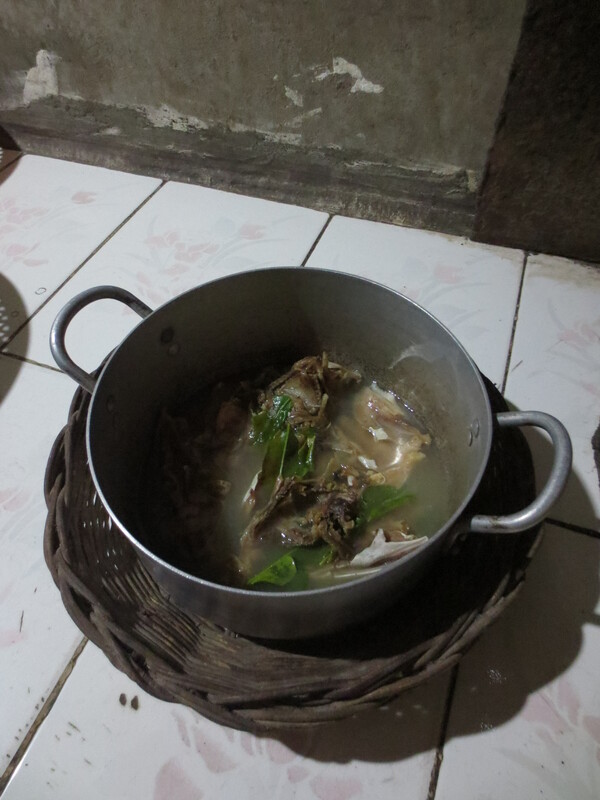 Simple and straight-forward, she made a stock of sorts by simmering the fish heads in water. Later, she tossed in salt, palm sugar and kaffir lime leaves. A crispness was added to the dish when Savy finished each bowl with a julienne of green mango. Eyeing up our supper nose-to-nose, a taste confirmed that a harnessing of often wasted resources can lead to great things. The depth of flavor the heads imparted the soup was simply divine. Myself included, squirming at the thought of heads for dinner, it goes to show that when we open our minds to a new way of thinking, as was the case when GERES consulted with the local stove producers, what we find in the end may be better than before. Bring water to a simmer over medium-high heat. Toss in fish heads and allow to simmer, about 5 minutes. Add salt, lime leaves and palm sugar and stir to combine. Simmer another 5 minutes and then remove from heat. Garnish with green mango and serve with rice. For more on GERES and to support their work with families such as Savy’s, click here.